PB 17:This book was better than other movie based picture books that I have read. I could detach myself from the movie more and think of the book as a story in and of itself. This book teaches a lesson about sharing (which is something Bella is working on right now) so I think it hit my heart for that reason too! 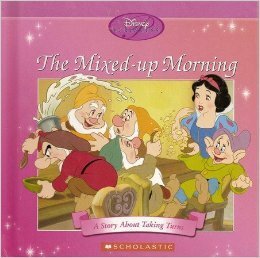 a good twist of the snow white and the seven dwarfs which teaches children about taking turns.